These days I hear a lot of statements that begin with "Things being the way they are now." A group of west Sonoma County citizens founded Heart & Hammer to do something about things being the way they are. After discussion, the group is taking its first action toward "tangible solutions in our local community that we believe will lead to national healing," according to group member Ellen Cavalli, who's also cofounder of Tilted Shed Ciderworks, by launching a fundraiser for Centro Laboral de Graton (CLG)—the Graton Day Labor Center. "This is the first time anyone has taken on raising funds for us," says CLG executive director Christy Lubin. "We can't change what's going on in Washington, but it's really beautiful that these women are standing up." 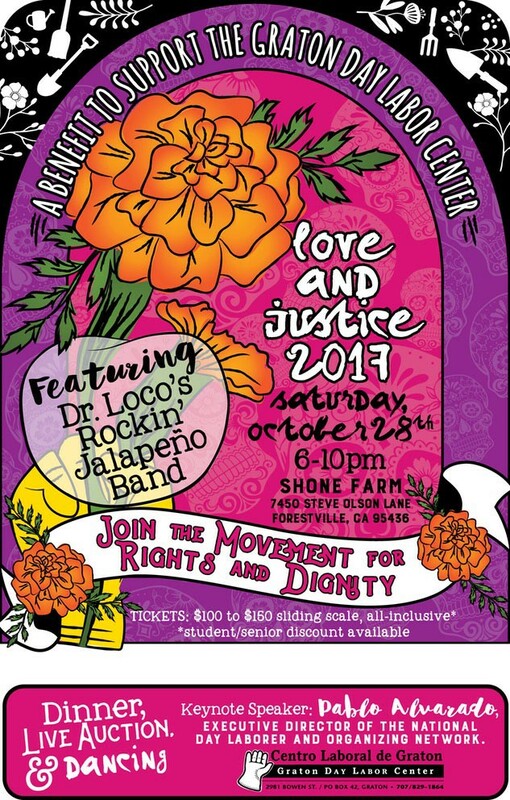 Dr. Loco's Rockin' Jalapeño Band headline the event, which is titled "Love and Justice," and Pablo Alvarado, executive director of the National Day Labor and Organizing Network, is the keynote speaker. "He's always just spot-on in his analysis of the current situation," Lubin says. The $100-plus ticket price, which includes a sit-down dinner, beer, wine and cider, and the opportunity to bid on auction items and enter a raffle, will be discounted for students and CLG workers. Proceeds will fund the center's outreach and organizing efforts, including labor-rights education for domestic workers, who often have restricted access to information and support. Love and Justice 2017 at the Shone Farm Pavilion, 7450 Steve Olson Lane, Forestville. Saturday, Oct. 28, 6–10pm. Tickets, $100–$150, or donate a ticket to a low-income community member for $95. Want to break out the bubbly a little sooner in the calendar? Breathless Wines celebrates its tasting room's first year with a 1920s-themed circus-style party. The team at Breathless, a charitably focused sparkling wine outfit, encourages costumes, and sights include performers and live animals. Ten percent of ticket sales benefit Healdsburg Health Foundation. Cirque du Breathless at Breathless Wines, 499 Moore Lane, Healdsburg. Sunday, Sept. 17, 1–3pm, 4–6pm. $29. 707.395.7300. Harvest starts out with a blessing of the grapes at some wineries, but by October, it may be mostly cursing of the grapes, from what I've heard. Bless the animals, instead. While it's mostly dogs at St. Francis Winery's annual Blessing of the Animals, I'm told folks bring birds, fish, horses and turtles to receive a blessing from a real, live Catholic priest. Silent auction and raffle proceeds benefit the Sonoma County Humane Society. St. Francis Winery & Vineyards, 100 Pythian Road at Highway 12, Santa Rosa. Oct. 1, 2–5pm. No blessed fee.